At about 11 a.m., James Scott Rimbach was ranting at a neighbor, making threats and being very loud, sheriff’s officials said. Rimbach was inside his family’s downtown Cambria home on Bridge Street at the time. Law enforcement was aware from the start of the incident that Rimbach has a history of mental health issues, including a previous arrest for elder abuse, and that he was recently released from detention. Initially, deputies waited in a nearby church parking lot, as they could not reach Rimbach’s mother and grandmother and since no crime had been reported. Rimbach’s mother and grandmother returned to the home at about 1:30 p.m. Shortly later, Rimbach was arguing with them on the front porch. The Cambria man struck his grandmother, causing lacerations on her face and forehead. He also grabbed a broom out of his mother’s hand and used it to hit his grandmother. Deputies then responded to the home, as did an ambulance, which transported Rimbach’s grandmother, Elizabeth Reese, to Sierra Vista Regional Medical Center. Reese is currently in stable condition. Along with state parks rangers, deputies set up a perimeter around the home and began negotiating with Rimbach. Negotiators had several conversations with Rimbach by phone and in person at the front window of the home. At 3:30 p.m., authorities closed the intersection of Main and Bridge streets as a safety precaution. Within 30 minutes, Rimbach came outside with his dog, spoke with negotiators and eventually surrendered. 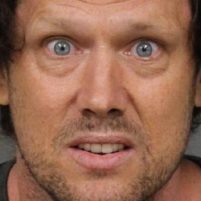 Deputies arrested Rimbach and booked him into the San Luis Obispo County Jail on charges of felony battery causing serious bodily injury, felony elder abuse causing serious bodily injury and felony assault with a deadly weapon other than a firearm. Rimbach remains in custody with his bail set at $100,000. Side_Show_Bob Sorry we don’t publish those sorts of cures for Trump Derangement Syndrome or any Syndromes.